A Mothers Ramblings: The Yummy Mummy with No Tummy Challenge - Week Three! The Yummy Mummy with No Tummy Challenge - Week Three! First thing, I am so proud of everyone who has emailed, left comments or Tweeted to me about their own personal challenges and reasons as to why they want to lose weight and/or get fit. I really do think that admitting that you are doing something is the first step to making sure that you follow through with doing it, so Good Luck and Healthy Eating to you all! I like all food, but I need chocolate. I find that chocolate is my huge temptation and having a little just doesn't do it for me. I have to go to the extreme either none at all or a whole bar and so when I decide to lose weight (as I have in the past) chocolate is cut out of my diet. The problem is that then when I have lost some weight I want to have a little chocolate to celebrate and a little turns into a lot, which turns into lbs. So this time I am doing a couple of things differently. The first thing is there are small snack bars of chocolate in the freezer and I have promised myself that if I need to have some chocolate that I may have one of those bars. So far I have had one bar. The second thing that I am doing is chewing on chewing gum a lot more. 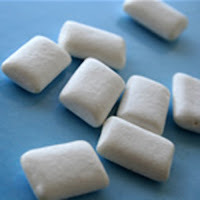 Sugar free chewing gum is sweet (just like chocolate), gives me something to do with my mouth (chew), and is only around 5 calories a piece and it takes me about ten seconds running up and down my stairs to burn 5 calories. Oh and if I have chewing gum in my mouth it is really hard to eat anything else! I have found that these two small changes are helping a lot, I am slowly not craving chocolate and I am using less and less gum. So this week my challenge is for you to see what your major downfall is. Your food diary may hold the answer here, aren't you glad I suggested those last week? Think about what food you reach for, what food it is that you crave and see if you can work out how to incorporate it into your food plan. Don't forget to keep you food and exercise diary's going and those extra 15 minutes of exercise a day! If we learn a habit or two a week, we will be living the life we want to lead before we know it!